Dental Implants are a great solution to replace missing teeth. Whether you’re replacing a single tooth, or multiple teeth, Dental Implants will offer a comfortable, fixed and permanent solution to your problem. 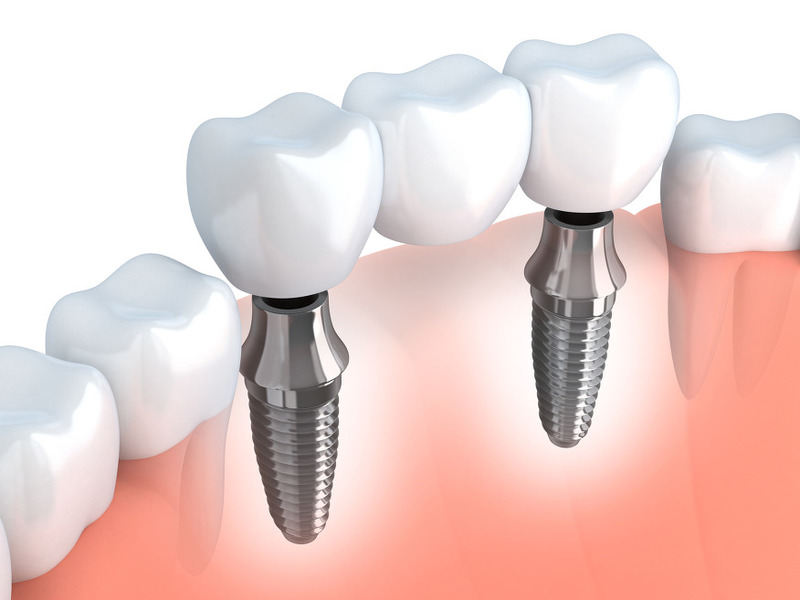 The dental implant is a titanium post that acts to replace the root of the missing tooth. Therefore, this method of tooth replacement closely resembles that of nature, as the entire tooth is replaced including both the root and the crown. The dental implant is surgically placed in the jaw by our implant dentist at our ryde implant clinic. The implant is left to heal in the jaw bone until it is said to have completed “osseointegration” with the patient’s own bone. In the meantime the patient will have a provisional tooth until the procedure is completed. Following approximately 8-12 weeks of healing, the implant is uncovered and the process of making the final tooth restoration begins. An Impression is taken of the implant to help determine the size and shape of the final crown. A connection called the “Abutment” is placed directly on top of the implant. The abutment is the part that sticks out of the patient’s gum and acts to connect the final tooth to the implant itself. The final crown is then placed over the abutment and the tooth replacement is now complete. The result, a restoration that looks, acts and feels just like a natural tooth. Dental implants can be also be used to replace several missing teeth. Since implants act as building blocks for us to place teeth on, they can be utilised in similar fashion to replace several teeth in line in the form of an implant bridge. Following the removal of the teeth, two or more implants can be placed. It is important to note that it is no longer the case where each missing tooth requires a separate implant. In some cases for example where four teeth in line are missing, the teeth can be replaced with only two implants. Not only are the complications fewer with minimal implants, but the cost is considerably less too. This is why it is important for each case to be assessed by a clinician who is experienced in both placing and restoring implants, and it is also why it is difficult to quote for implant treatment over the phone. It may cost much less than you think! The implant bridge is completed in a similar way to how single teeth are replaced. The impression of the two or three or four implants is taken. Our talented Australian based ceramists and technicians work closely with our Ryde Implant team to fabricate the final prosthesis. A final restoration that is permanently fixed, looks really good and ready for use. Where a patient has a decayed or damaged tooth that needs to be removed first, the traditional approach is to remove the tooth and wait approximately 8-12 weeks for the bone to heal before placing the implant. In some cases, based on the assessment by our Ryde Implant dentist, an “Immediate Implant” procedure can be performed. This involves removing the tooth and placing the dental implant on the same visit. This minimizes the number of surgical appointments as both the tooth removal and implant can be placed at the same time. In some cases, an “immediate restoration” albeit temporary, can be placed at the same time the implant is placed. They come in several forms and our dentist will discuss all options with you. So if you have a missing tooth, or a tooth that you know will need be removed soon, or if you have several missing teeth and you’re wearing an uncomfortable partial denture, come speak to us first for a no obligation complimentary consultation at our Ryde dental implant clinic and our dentist will discuss all your options with you.